At CG West, we listen to the concerns and needs of our on-premise laundry customers before ever starting a project. 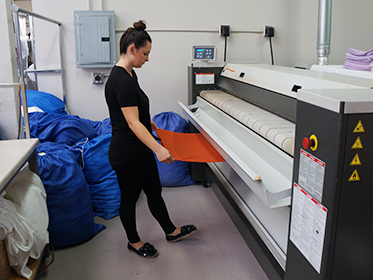 Prior to outfitting a new laundry, or an existing one, we visit the facility and carefully assess workflow, labor, production and efficiency. We make laundry solution recommendations based on that analysis and your operational goals. We offer Continental high-speed washer-extractors and high-performance flatwork ironers and drying tumblers to meet the individual needs of an array of on-premise laundries, including health care facilities, hotels and resorts, dry cleaners, salons, spas, athletic facilities, campgrounds, fire departments, vet clinics, health clubs, and more.